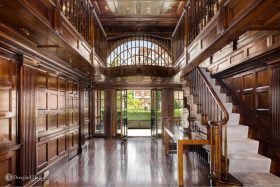 The brick Georgian townhouse in Sutton Place designed for Anne Vanderbilt, the wife of railroad heir William Vanderbilt, has hit the market for $21 million. Located at 1 Sutton Place, the 15-room home sits on the northeast corner of 57th Street, punctuated by a bright blue front door. Vanderbilt, along with a group of wealthy buyers, is credited with turning the remote, riverside Manhattan neighborhood into one of the city’s most influential areas. 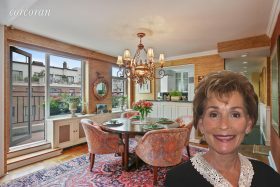 The former Sutton Place pad of the queen of court TV, Judge Judith Sheindlin, has hit the market for $3.29 million. The Brooklyn native sold the duplex penthouse at 60 Sutton Place South with her husband, Gerald Sheindlin, for $2.25 million in 2010 (h/t NY Post). Found on the 19th floor of the building, the co-op features three bedrooms and three and a half baths. Plus, the 2,250-square-foot apartment comes with two terraces overlooking the East River. 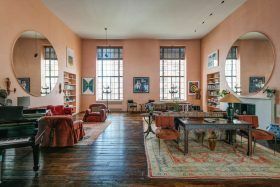 After first hitting the market in June for roughly $5.2 million, the former Sutton Place home of influential New York senator, Jacob Javits and his wife Marian, has found a buyer. Last listed for $4.35 million, the three-bedroom co-op at 322 East 57th Street was designed in 1933 by Joseph Urban, an architect known for his Art Deco style. According to the New York Post, Javits entertained socialites and political players, like Henry Kissinger, in his spacious 3,300 square foot duplex. This sprawling three-bedroom at the exclusive Sutton Place co-op The Campanile may have a private location, incredible East River views, and old-world details such as wall-to-wall pine wood paneling, working fireplaces, and tons of built-ins, but it was its longtime resident who encited a bidding war. 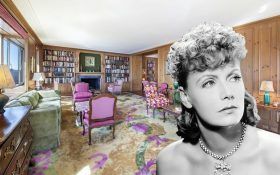 Mansion Global reports that Greta Garbo’s longtime home (she lived there from 1954 until her death in 1990) has sold for $8.5 million, 43 percent higher than the $5.95 million it listed for back in March. 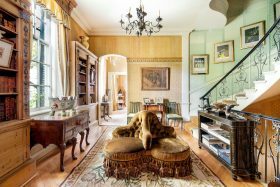 The late actress’ great-nephew Craig Reisfield said the buyers have “a reverence for my great aunt” and added that he anticipates them being “great stewards” of the home that’s very much intact from Garbo’s days. 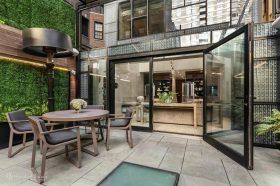 It’s not every day a six-story apartment hits the market in New York–and it feels like a bonafide townhouse within the new Sutton Place condo 441 East 57th Street. The four-bedroom pad, with a sprawling 5,550 square feet, has hit the market for $9.5 million. (After last selling in 2010 for $9.4 million, it’s struggled on the market, asking everything between $13 and $9.499 million.) On top of tons of custom interior details, floor-to-ceiling glass doors open to a private 500-square-foot deck with all the outdoor perks. 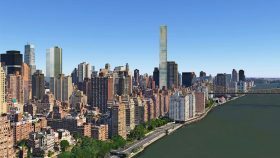 Gamma Real Estate will stop work on Sutton 58, a proposed 800-foot-tall residential tower at 3 Sutton Place, after the New York City Council voted on Thursday to rezone 10 blocks on the Upper East Side. According to The Real Deal, the rezoning requires properties between 51st and 59th Streets east of First Avenue to follow ‘tower-on-a-base” rules, meaning 45 to 50 percent of the building must be built below 150 feet. This drastically changes the developer’s plan for a soaring skyscraper and also caps the height of future buildings. 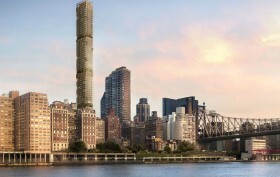 The City Planning Commission approved a resident-proposed plan to curb the development of supertall, skinny towers in Sutton Place on Wednesday, capping the height of future buildings. However, because of a clause inserted by the commission, projects already under construction will be grandfathered into the current zoning rules. 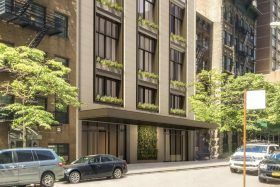 This comes as good news for Gamma Real Estate, the developer currently constructing an 800-foot-tall residential tower, now called Sutton 58, at 3 Sutton Place. Gamma needs to finish the foundation planned for their luxury condominium tower before the city votes on the rezoning proposal, to be immune from new height restrictions (h/t Crain’s). In what they’re calling an “unprecedented citizens’ application,” the East River 50s Alliance, a Sutton Place/Midtown community group, has mounted a renewed campaign to oppose an 800-foot tall condo tower that’s rising at 430 East 58th Street, the Wall Street Journal reports. As 6sqft previously reported, the developers of the new tower, Gamma Real Estate, closed on the $86 million site earlier this year in a bankruptcy sale and hired Danish-born architect Thomas Juul-Hansen to design the new skyscraper. The group has filed an application for a zoning change that calls for a ban on tall towers in a 10-square-block area; developers regularly file for zoning changes that cover only the property they’re looking to build on.